An incredible true story, for fans of Katie Piper and inspirational books. A girl with her whole life ahead of her. A terrible accident. An inspiring story of triumph over trauma. Aged 15, Jordan was a happy-go-lucky girl; having fun with friends and loving life. In one fateful moment, everything changed. A car accident left her paralysed from the chest down and shocked her into deep depression. She was on the brink of giving up. But gradually Jordan realised there is hope beyond utter devastation, and life beyond disability. Painstakingly re-learning how to apply her beloved make-up, Jordan began to rebuild her sense of self and empowerment. Her body may have been broken but her spirit was not. She is now a successful beauty blogger and her journey of positivity inspires millions around the world. 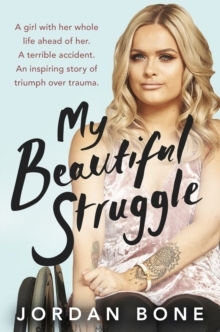 MY BEAUTIFUL STRUGGLE is the incredible true story of how one young woman overcame immense challenges, of inner strength that lies beneath outer beauty, of how to believe in yourself and find the light when it feels like all hope is gone.